For many people the term "Persian rug" is synonymous with oriental rugs in general. Certainly the variety of Persian rugs, from the sophisticated larger versions made by master weavers to the smaller but no less charming nomadic Persian rugs, is extraordinary. The colorings of Persian rugs are invariably rich and deep, usually with a ground of crimson backing symbolic, figurative or naturalistic motifs. Persian rugs vary in design and color depending on what region they come from. Saruks, Hamodans, Kashans, and Kirmans, all named for the towns they come from. The most usual material for Persian carpets and rugs was, and is, wool, but particularly fine silk Persian rugs are now much sought after. In fact, there is an old Persian saying: "The richer the man the thinner the carpet", which refers to the superb quality of the finest silk Persian rugs. The main advantage with Persian rugs is that the older they get the better they look. Persian rugs are not deemed to be their best for some 30 to 40 years. Persian rugs are characterized by their wonderfully rich colors and strong designs and motifs. They are made using either wool or silk threads that are knotted by hand and then backed onto a deep red weave backing. Although many countries around the world use traditional Persian designs, all genuine Persian carpets and rugs are made in Iran and nowhere else. The selection and diversity of Persian rugs is astounding. Whilst this type of rug can come in all sorts of different shapes and sizes, from the small, delicate tapestries made by hand to the huge carpets produced by expert weavers, you will find that the majority of Persian rugs are made of wool. There are, however, exceptions to this rule. Fine silk was sometimes used to create a carpet for those rich or royal enough to afford it. These silk variations are rather rare and of course very much sought after today. One thing that is certain where a genuine Persian rug is concerned is that, unlike a lot of other rug designs, it will invariably improve with age. In fact, a rug is regarded as too new if it is less than thirty years old. The Persian rug industry is one that began as a simple trade and developed into an art form. There are a number of periods in history that stand out as significant where the development of Persian rugs and tapestries is concerned. The first, and perhaps the most notable, occurred between 1502 and 1722 during the reign of the Safavid Dynasty, when a number of royal weavers were employed to create new and exciting designs. The design and color of your Persian rug depends on its place of manufacture, and each one is named after the particular town in which it was weaved. 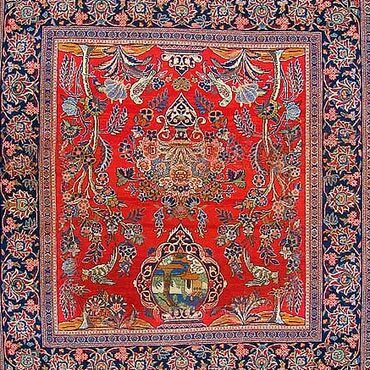 The Kirman design, for example, is usually made with a very pale red or blue dye and tends to depict one central image or symbol, whilst the Kashan variety is often green or ivory in color with wonderful curved patterns throughout. Select from the most beautiful rug designs in the world.